FIVE years after 10 pupils – between the ages of 8 and 18 – were killed while on their way to school, their families are still finding it difficult to come to terms with their deaths. The minibus taxi transporting them was hit by a passenger train at a level crossing in Blackheath. 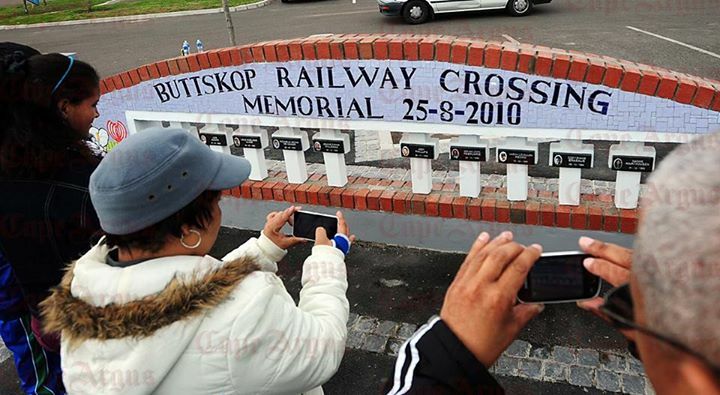 The driver, Jacob Humphreys, jumped a queue of cars waiting to cross the Buttskop crossing and then attempted to cross the tracks while the booms were down, in August 2010. Humphreys was originally handed a jail sentence of 20 years in December 2011 for his role in their deaths. However, on appeal, it was reduced to eight years. Yesterday, the City of Cape Town unveiled a memorial wall in the Welmoed cemetery – where six of the children are buried – in honour of the 10 children who died|in the crash. The family of Jason Pedro are still finding it difficult to deal with his death, but his mother, Ursula , said they soldier on each day. Jason, 15, was her eldest son. Pedro said her other sons sometimes still “struggle to go to school because of the pain”. She said the family were grateful for the wall of remembrance and said she liked the picture of her son placed in the plaque with her son’s name and date of birth. At eight years old, Reece Smith was the youngest of the children. His mother, Rochelle, said Reece’s brother, Wyman,16, was unable to verbalise what he felt, but “he was still very hurt”.